Get Off The Tracks~My Train of Thought Is Heading Your Way! Maybe it’s the heat. I shouldn’t be able to blame the heat because I haven’t been out in it that much. I’m lucky that our air conditioning is functioning well and keeping us comfortable. Even though I’m out walking in the moring, I’ve been doing it early which gets me out before the real heat comes. I’m sticking with it. I have to make a confession and in truth this was an honest mistake. Quite a few years ago, I had marked out a route for walking. It’s great…starts out level, then goes through several uphill areas…good for cardio. I did the route with my car to track the distance. I was certain it was 2 miles. Maybe the odometer on that car wasn’t working properly. I’ve been saying proudly 2 miles! I just realized yesterday that my pedometer can also tell me the miles I walk. According to my pedometer, when I got home yesterday I had walked 1.26 miles. 😦 That is Not 2 miles. I don’t usually look at the pedo while I’m walking…guess I’ll have to today to see if I can pump that up. Hey, but I’m walking right! I got an important “pack for the trip” project completed yesterday. I had a set of dishes stored at Ele’s house that I want to take for the house in New Mexico. I got it all packed up and in a duffle bag. It’ll travel safely in the car that way. Just have to prepare for the question from Ralph…”WHAT have you got in there?!? !” I know it’s coming. Here’s where my train of thought goes off track. 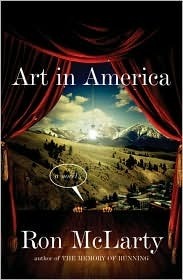 I’m reading a book called Art in America by Ron McLarty. This was a series by Steven Boccho who created Hill Street Blues, L. A. Law, and later NYPD Blue and my personal favorite, Murder One. But back then when I heard that Cop Rock was coming on I remember saying to myself…it’s a Steven Boccho show AND there’s singing! How can it miss?! Well by a lot of peoples standards, it was a Big miss. I, however loved it! I was sorry when it was cancelled. I remember a few years after it went off the air, VH1 showed the entire series in one day. Back when VH1 still showed music videos and seeing a TV series aired there was unusual. But there was the singing…It was perfect. I taped the entire thing. So back to thinking about Ron McLarty, I started thinking about whether Cop Rock was available on DVD now. I started searching on Google. No. Not just No, but NO! And apparently there are a lot of people waiting Very impatiently for it to be released! I have something Very Valuable hiding Somewhere in the boxes of my video collection in my basement. That alone should get me digging through things. Besides, I’d really like to watch it again. Seems like I’m one of the few people who Could watch it. I guess that’s kind of exciting. Except, I have to pack for our trip…So however exciting it is to know I have something that a lot of people want…I need to get this train back on the track…Go figure out just how much 2 miles is…and get packing!! This entry was posted in Uncategorized and tagged books, exercise, sorting and packing, The Human Randomizer, Ultimate Blog Challenge, walking. Bookmark the permalink. happy digging, fran! finding cop rock is like going on a treasure hunt, esp if you can sell it for $$!! good luck! ok – must talk about the walking distance…i would trust your car odometer. we sell pedometers at the store, so i have some experience with them…they are fine for getting an IDEA of the # of steps you take per day, but are quite unreliable in tracking DISTANCE. to get an accurate distance measurement, you need to get a GPS unit (like from garmin or nike). here’s another idea: use the g-maps pedometer tool – just google that to find the website. that’s what i use and it’s super useful and easy to use! have a great day – hope you get to read, walk and prep for the trip! Thanks, Cathy! I feel better now. I’ll look up that tool to see what it tells me. I was really disappointed when I saw that. Gotta run!…er…Walk!! Before it gets too hot! Have a great day!! Have fun packing! I am really sad and I love packing! hahaha. I love it when you get off track. at least… with words and stories, not with weight watchers. 😉 I was afraid it was going to be a less-than-happy post. I’m going to look up the memory of running. just the title has me intrigued. Hello, Miss!! I think I already donated that one or I would be glad to give it to you! I’m really enjoying Art in America! It’s funny…I think the posts are pretty funny when I get off track, that way, not with WW. I think I’ve been pretty well on track w/WW this week. The walking helps and I’m really enjoying it!! Elle, Thanks so much. That means a lot coming from a real writer. I figure if I’m going to do this I should make it fun for everyone…including myself! Cop Rock was only on for one seasn then it got the Boot! I love quirky things like that and Steven Boccho is a brilliant producer/director. He gathered a terrific cast of performers. Yes, it was silly, police officers bursting into song. Has anyone heard of Opera?! Anyway…thanks so much for the big compliment! I have never seen Cop Rocks but sounds interesting! I guess I won’t get to see it in the near future! Good luck with the rest of your packing–when do you actually leave? I hate it when I discover a series after it has already been canceled. It makes me sad. On the upside, watching the entire series all at once, instead of waiting week to week, can be lots of fun! Hi Elle, thanks for stopping by! I’ve love doing that with a show, watching it all at once or over a weekend. I actually did see Cop Rock when it was on. It was such fun. But apparently I was among the minority… 😦 Please come to visit again! Did you calibrate your pedometer? I would imagine your stride is fairly long. To see how accurately it measures you should go someplace that is mile marked (there are a couple of parks near me with marked trails) or try a track at High School to see if it is the ped or your route guestimate that is off.